According to the last annual report of broadband coverage in Spain published by the Ministry of Industry, Energy and Tourism, the purpose of the General Law of Telecommunications is to achieve the universalization of the access to the broadband Internet to 30 Mbps in 2020. Unfortunately, that objective is far away from the reality because more than 30% of homes don’t have access to the Internet with more of 10 Mbps. This is due to the high price of broadband in our country in relation to the rest of the EU. This situation is much worse in the rural areas of the country, where the 44% of the population doesn’t have access to any type of broadband. However, Spain is in the 40th position in the WorldWide Ranking of countries with access to the Internet, leaving behind countries like Ireland or Hungary. In Catalonia, the situation is way much better in the broadband society. Our autonomous community is the 3rd land with more coverage of new generation broadband (fiber optic), exactly 83,16%, above the state average, which is 76%. This includes around 1.050.000 Catalans of 606 houses which have this new and important technology. This great achievement has been accomplished thanks to the New Generation Broadband Extension Program (PEBA-NGA, its initials in Spanish), which facilitated the access to the networks of high speed broadband to a population of 6,27 millions of inhabitants. Catalonia and also Andalusia have been the communities where more aid has been granted to new generational broadband extension projects. If we go deeper in one of those cities of Catalonia that have the latest version of broadband, we find that Viladecans is a pioneer in this sector. This city, located 15 minutes away from Barcelona and between the international airport of El Prat de Llobregat and Castelldefels, has a population of 65.000 inhabitants. The department of ICT of the town hall has around 450 employees and manages a lot of technical services for the citizen linked to the Smart City project. Viladecans is considered an area of citizen innovation and incubator of ideas and projects to promote technological learning. 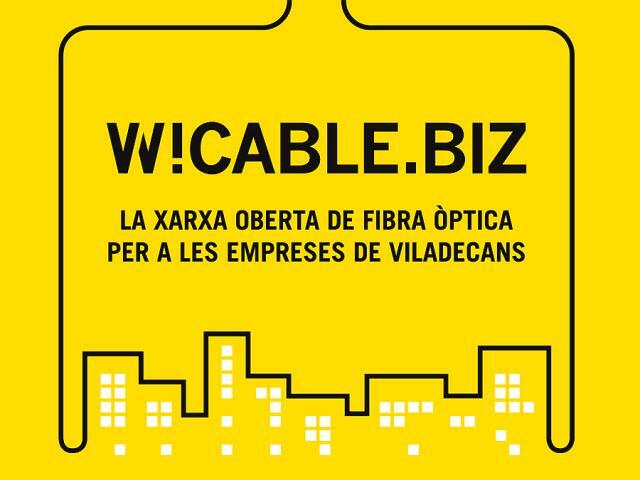 In this ambit, Viladecans bet on high speed broadband and, in particular, on fiber optic with the network called W!CABLE. According to the mayor of the town “the Internet is a right and not a privilege”. For that reason, this infrastructure of the W!CABLE is an open network of new generation telecommunications based on fiber optic deployment technology to the home, which allows the provision of high connectivity services, it means ultra-fast broadband up to 1 GBps. The main aim of this municipal net is to provide the best quality and competitive broadband to all homes, companies, business and facilities of the city. 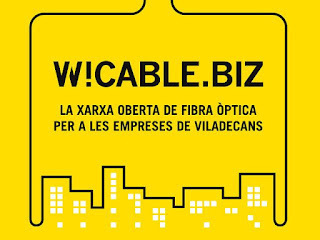 Nowadays, approximately the 50% of the inhabitants of Viladecans can benefit themselves with any of the W!CABLE services, according to the conditions that best suit each situation and with any of the four operators that provides it: Adamo, Parlem, the Xarxa Oberta de Catalunya (XOC) and APFUTURA. The town hall developed this infrastructure in 2010 so that it could offer to all the communications operators the possibility of providing their services through W!CABLE. At that point, they built a neutral operator, which means that it can be used by multiple operators at the same time. In this 1st phase, they collaborated only with Orange and Adamo and had an impact of the 40%. Secondly, they extended the project, not only to the principal points of the city, but also to the business park and interurban companies, reaching 50 companies connected with them. Finally, the 3rd phase in July 2015 focused on the town hall making a concession of the management and growth of the network to the company Overon, from the Mediapro Group. They were expected to make an investment of 4 million of euros so that the W!CABLE could be extended progressively to practically all the corners of Viladecans. Moreover, they committed themselves to manage the network during the following 15 years. The results have been great since that year: in 2015 W!CABLE was active in 15.352 points, whereas the last year was active in 21.000 points. In addition, it connected more than the 90% of the homes, business and shops of Viladecans. W!CABLE remains being municipal property and continues working as a neutral operator. Those achievements show that the city has an open network to any operator who wants to offer their services of Internet, phone or television, which involves providing more competitive and varied offers to the population. In that way, we can see that W!CABLE guarantees from 100 symmetric Mbps to any needed, services adapted to the needs of each company and access to business from any area of the city. For that reason, today around 11.000 homes and more than a hundred companies can contract that services through any of the operators that use W!CABLE. However, W!CABLE is not the only network of fiber optic in Viladecans. There are telecommunications operators, such as Movistar, Vodafone or Orange, that are also deploying fiber optic in Viladecans, which contributes to the city having one the widest offer of telecommunications services in the entire state. According to an article of La Vanguardia, Viladecans is the only municipality of the area with a double management model in this type of infrastructures, in such way that it multiplies the offers and services to which the neighbors and businessmen of the city can accede. In addition to all this important information about the W!CABLE in Viladecans, it is remarkable to highlight one important achievement in the education sector and that is the implementation of this network in the day-care centers, schools, high schools of the city (public or private), the Escuela Oficial de Idiomas and the Centro de Formación de Adultos. From the high direction, they have called this concept the W!escuela: it consists of an education center that has an Internet connection of 100 Mbps with fiber optic and around 160 blackboards distributed throughout its classrooms. The commitment of the city council was to promote technology in schools and, for that reason, they have already connected all the educational centers to the Internet with the most advanced digital tools. In this educational implantation, the fiber optic plays an important role: it improves the operation of the digital blackboards because with more speed they can access to a higher quality multimedia contents such as video files, high resolution images or more sophisticated educational applications; also improves the management of the center in terms of energy efficiency because it’s possible to track the consumption of water and light in real time and remotely to apply corrective measures in order to save energy and for doing that it requires ultra-fast broadband. 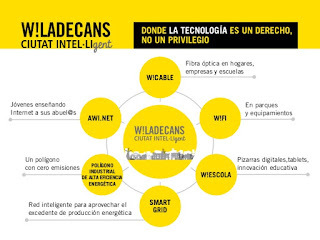 In conclusion, we have seen that Viladecans is a very developed city in the technological area, always looking to the welfare of its inhabitants and with a very personal brand of broadband, the W!CABLE. We analyze broadband evolution (here, the Viladecans case) in this blog, in Research Group about Digital Journalism and Marketing and Broadband and in Research Group on Innovative Monetization Systems of Digital Journalism, Marketing and Tourism (SIMPED), from CECABLE, Escola Universitària Mediterrani of UdG, UPF and Blanquerna-URL, in Twitter (@CECABLEresearch), Google+, in the group of LinkedIn, in the page of LinkedIn, in the group of Facebook, in Instagram (CECABLE), in Pinterest and in this blog. We will go in deep in the XXIV Cable and Broadband Catalonia Congress (9-10 April 2019, Barcelona). Molt interessants aquestes anàlisis sobre banda ampla en entorns locals. Felicitats! Estudiar casos locales es una acertada iniciativa. ¡Enhorabuena! Adorei o seu articulo achei muito interesante e inspirador o senhor abriu os meus olhos sobre ese tema . Parabens ! Grupo Larissa . Fantàstic Joan, interessentíssim article sobre la banda ample dins dels municipis! encara que ni hagin de més petits o més grans, la connexió és necessària a tot arreu! Salutacions. Despres d’haber llegit l’article, el WCABLE és una xarxa oberta de telecomunicacions de nova generació basada en tecnologia de desplegament de fibra òptica per a la llar, que permet la prestació de serveis d'alta connectivitat, el que significa banda ampla ultra ràpida de fins a 1 GBps. L'objectiu principal d'aquesta xarxa municipal és proporcionar la millor qualitat i banda ampla competitiva a totes les llars. Muy interesante este artículo Joan, creo que aunque existan lugares mas remotos o pequeños y algunos más grandes y habitados, todos tenemos derecho a tener conexión, ya que no se ha de menospreciar a nadie y de esta manera podemos estar conectados por todo el mundo y de una forma más rápida. Opino que se las cosas avanzan, hemos de avanzar todos juntos! ¡Muchas gracias por tu comentario, Ingrid! Muy buen artículo Joan, es interesante saber los datos que proporcionas sobre la conexión a internet! Es necesario que desde los pueblos más pequeños, municipios como Viladecans y/o ciudades más grandes estén conectados al mundo entero. Un article molt interessant sobre la banda ample i el dret que hauriem de tenir tots de tenir accés a la mateixa, ja que hauria de ser així i poder avançar cap al futur tots junts! Per cert, moltes felicitats pels 50 milions Doctor!! Molt bon article i molt interessant! Encara que existeixin llocs més allunyats o petits, hauria d'haver connexió a tot arreu! Enhorabona! Después de haber leído el articulo puedo observar como zonas como Viladecans disfrutan de nuevos avances tecnológicos en la fibra óptica y las ventajas que eso conlleva, tanto en el desarrollo de los trabajos como en el área educativa. Creo que es un muy buen sistema que debería implantarse en más ciudades. Muy buen articulo y muy interesante!! Molt interesant l'article sobre la banda ancha. Viladecans hauria de servir com a referencia! Moltes gràcies pel teu comentari, Adri! Me parece un articulo muy interesante, ya que muestra las ventajas que se van viendo en lugares mas pequeños como Viladecans, y tambien poder observar el impacto de las TIC en la sociedad pero sobretodo el impacto de la banda ancha. Y sobretodo el derecho que tiene todo el mundo a tener conexion, sea en un lugar grande o pequeño y espero que se implante en más lugares . Viladecans es un referente de la banda ancha, es lo que he aprendido leyendo este artículo. Es muy interesante. ¡Muchas gracias por tu comentario, Éric! Trobo molt be que a Viladecans s'instal·li de manera tan eficaç una bona conexió a internet, no només de manera residencial sino que també per als indrets publics i les escoles que ho necesitin. Encara que em costa creure que les altres empreses telefoniques poguin mantenir-se obertes en una ciutat com aquesta quan ja tenen un servei tan excepcional. Article molt interessant sobre la banda ample! Considero que aquest sistema hauria d’estar implantat també en altres localitats. Moltes gràcies pel teu comentari, Blanca! Con este artículo nos damos cuenta de la importancia de la conexión en lugares mas alejados del centro de la ciudad, ya que es necesario para las personas e instituciones que hay allí como los colegios. Muy interesante ver como se va avanzando en este tema y poco a poco. Todos tenemos derecho a una buena conexión. Me parece perfecto que empresas como wcable intenten hacer llegar la conectividad y banda ancha a zonas fuera de las ciudades pues es de todos tener la posibilidad de tener este servicio. Bajo mi opinión creo que es un articulo muy interesante y que nos permite conocer las ventajas a cerca de la banda ancha que se van implantando en lugares más pequeños como el caso de Viladecans. Hay que destacar la importancia a cerca del derecho que tenemos todos a tener conexión y a estar conectados al rededor del mundo entero, incluso desde los pueblos más pequeños y remotos, como es el caso mencionado de Viladecans. Poco a poco vamos progresando y cada vez se implantará en más lugares. ¡Muchas gracias por tu comentario, Diana! Estem molt acostumats a tenir banda hancha i després quan anem a llocs com el nostre poble on ni tenim ni dos meges en desesperem! En el meu cas hem passa cada vegada que vaig a Mora d'Ebre! I think nowadays it is important to have broadband internet service which is accesible even if we are travelling to remote places. Since all the necessary tools that we are using on a daily basis in our mobile phones require internet, the connectivity is key to promote tourism. Molt interessant el teu punt de vista, considero que es important tenir consciència sobre l'arribada dels serveis mínims per tal de crear una comoditat per els de fora també. Un article molt interessant, gràcies per compartir! Em sembla molt interessant saber que Catalunya és una de es CCAA on s'han donat més ajudes per a projectes de banda ampla. Em sembla molt correcte que empreses com WCable ajudin a localitats menys poblades, fora de les grans aglomeracions urbanes, a estar més connectades tecnològicament parlant, beneficiant-se tant llars com empreses o negocis. Interessant saber com anem avançant en aquest terreny poc a poc! Moltes gràcies pel teu comentari, Laura!